When you think of water storage, it’s probably easy to imagine big metal water tanks protruding out of the ground. While that method of water storage is certainly effective, it’s not the only one out there. Whether you’re looking for a new system or you simply want to learn how different custom water storage tanks stack up, you’ve come to the right place. Here are three different custom storage tank materials and how they compare to one another. Fiberglass tanks are popular because not only are they lightweight, they’re built to last. 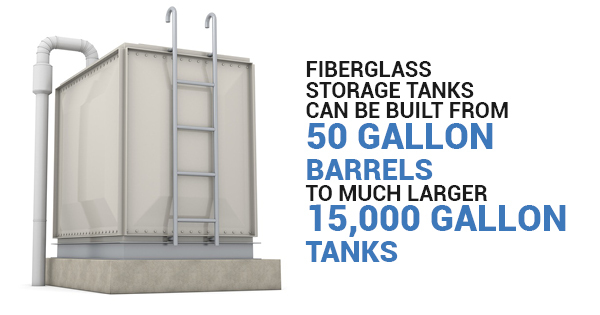 Fiberglass storage tanks can be built from small 50 gallon barrels to much larger 15,000 gallon tanks, so no matter the size of your operation you’ll have an adequate storage tank. However, smaller fiberglass tanks have been known to be expensive for their size, which has turned many business owners to polyethylene in the past. But for those considering fiberglass, it’s essential to note that the fittings on fiberglass tanks are created in a way that eliminates leaky fittings. As previously mentioned, some business owners prefer polyethylene to fiberglass because it typically has a lower price point. Not only that, but these tanks are probably some of the most common used for water storage. They are readily available at most farm, ranch supply, and large landscape retailers. Despite their prevalence, these tanks do have their faults. First, they are not known to hold paint very well. The simple solution here is to purchase a pre-painted tank rather than attempt to make your own custom storage tanks. The best thing about big metal water tanks is their long lifespan. Thanks to advances in galvanizing, corrosion resistance is vastly improved. This means metal waste water holding tanks and other metal storage tanks are highly resistant to rust and any other environmental factors. And most of the big metal water tanks you see today have been around for a while. In fact, some of them may have contributed to the 208 million Americans being served by centralized collection systems in 2000. No matter the facility you run or the storage needs you have, don’t forget to consider all of your options for storage tanks! And if you have any questions about a custom storage tank, don’t hesitate to reach out to the Modutank team.